Rev Jim Jones Horoscope - Importance of Dasha and Transits. So here we are with horoscope of Rev. Jim Jones. Again, if you are not aware of Jim Jones or events taken place on Nov 18, 1978 at Jonestown under his instructions, then please check these links - https://en.wikipedia.org/wiki/Jim_Jones and https://en.wikipedia.org/wiki/Jonestown. In short, I can just reproduce his introduction by Wikipedia page, which says - "James Warren "Jim" Jones (May 13, 1931 – November 18, 1978) was an American cult leader. Jones was the founder and leader of the Peoples Temple, infamous due to the mass murder-suicide in November 1978 of 918 of its members in Jonestown, Guyana, the murder of Congressman Leo Ryan, and the ordering of four additional Temple member deaths in Georgetown, the Guyanese capital. Nearly three-hundred children were murdered at Jonestown, almost all of them by cyanide poisoning. Jones died from a gunshot wound to the head; it is suspected his death was a suicide". I was just curious to find what planetary positions lead to such a horrible event that day and as Jim was one who oversaw everything, we need to look from his chart what made him do this act? 2. Dashas on Nov 18, 1978. 3. Transits on Nov 18, 1978.
a. As we can see, he was born a Sagittarius Ascendant with Ascendant Lord Jupiter in 7th house of People and Masses. As I said always, Ascendant is enough to give some idea regarding life path, we can see here. Sagittarius and Jupiter are naturally connected to preaching and 7th house is Masses or People. What was he? A Priest. Even the name of his Church was People's Temple. 7th house is People. Jupiter & Sagittarius are Temple and Preaching. b. 1st big indication of some crazy thing taking place is Rahu conjunct with Moon and Venus. Rahu is at 19.35 degree, Moon is at 20.00 degree and Venus is at 28 degree. All of them are in Pisces, a sign of spirituality. So, this position not only made him obsessive about Spirituality but Rahu-Moon at almost same degree shows that Moon was totally poisoned by Rahu. Venus presence there also shows his numerous affairs with his disciple ladies. But I am always most concerned about Moon position. I feel if Moon is well placed in chart, person will go through any suffering but never do something which is hurting emotions of others. He will keep a balanced mind. But if Moon is trashed like this, it shows a person who is unimaginably obsessive and wants to get what he wants anyhow. The best thing to do in such situation is Meditation. c. Third thing which gave ominous signs of his obsessive ways of achieving his desires is 5th house. 5th house is house of intellect. It shows how intellectually one thinks and takes decisions. Now, what is wrong with 5th house? Sun-Mercury in Aries. Exalted Sun. What else you want? Right? Wrong. I want 5th house lord also well placed. Aries lord is Mars and Mars is debilitated in Cancer in 8th house of Death and Sudden Events. So, his intellect level was nowhere helping him. Thing with debilitated Mars is, if no other support is there, that person only knows that he has to fight but he doesn't know how to fight? So in such circumstances, big criminal activities take place as person has no concern with Law and Order. 2. Dashas on Nov 18, 1978 - Now, if he was so dangerous then why he waited till 1978 end to show his true colors? That's why I say that our life always moves as per Dashas we are going through. Till 1977, he went through Mercury, Ketu, Venus and Sun Dasha. Pay attention that all these planets are either exalted in his chart or sitting with an exalted planet or their lord is with exalted planet. In Feb 1977, he started Moon Dasha. Bang, poisoned Moon along with Rahu got activated. Moon Dasha also activated 8th house with its Cancer sign, Mars got activated. It was time when he started materializing his ambitious plan of Jonestown. So, stage was set. Next? Antardasha. Rahu AD from July, 1978. His obsession increased many levels and his illegal acts at Jonestown were reported to US Congress. So, when MD and AD both planets are helping or indicating towards one event, then it was hard for any other planet in lower levels of dasha to manage things in a sane way. 3. Transits on Nov 18, 1978 - Now, the triggering point was transits on Nov 18, 1978. Dashas set up the stage of event but it is the transits of same and connected planets which trigger the event. On Nov 18, 1978, Moon (MD planet) was in Ardra Nakshatra, a nakshatra always responsible for chaotic events of huge damage. Another big thing was that Rahu and Ketu just changed their signs in transit that day and Rahu entered Leo. Leo is ruled by Sun, one of the biggest enemy of Rahu. Rahu also eclipses Sun. 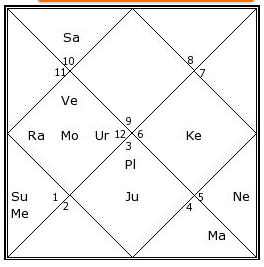 So, Moon and Rahu both were not in great positions, neither in birth chart nor in transit chart. But this also doesn't indicate such a horrific event. Then what else? Well, Moon MD activated his 8th house of Death and Sudden Events, right? And Mars was sitting there as debilitated. So, Mars is also active with Moon MD, Let's see where Mars was on that fateful day. Mars was in Scorpio along with Sun and Mercury. In birth chart Mars is lord of Sun and Mercury. So, all 3 planets went into Scorpio which is his 12th house of "Final Resting Place". Scorpio is sign of chaotic events and debilitated Mars of birth chart along with the planet it rules went into Scorpio and created one of the most horrific and chaotic event in Human History. Finally, would love to end with a quote of Buddha dedicated to all those who are looking for a Messiah or a Savior to guide their way or to take them to God/Enlightenment. Buddha said - "No one saves us but ourselves. No one can and no one may. We ourselves must walk the path."